Backing a new album and hitting the road, SOIL will be in both Madison and Milwaukee on April 2 and 3 respectively. SOIL plans to hit The Annex and The Rave harder than ever. Going out on a limb from their previous albums and getting back to their early rock roots, they have developed an album that “took them back to their youth”. There is a dark side to SOIL that really comes through. Without this darker element the album would be a standard rock record. 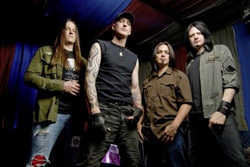 Their extreme metal influences, however, have added a biting edge to the new music. Even though they have reached the sound they have always wanted, SOIL continues to evolve and change. SOIL pride themselves on sticking to their guns, King explains, “Trends come and go very quickly. Our motto has always been ‘never say die’. We’ve never given up, and we are familiar with fact that you always have to make a sacrifice to achieve anything you want.” King attributes their longevity to their strong Midwestern roots. “Radio stations like JJO really allow honest bands like ours get places,” King thanks 94.1 for being a big supporter over the years. “[The Midwestern Attitude] isn’t as jaded as the rest of the country.” Their grass roots style and love of their fans keep SOIL going strong. SOIL hits The Annex on Friday April 2, and The Rave on Saturday April 3.